As a European one tends to think of Turkey as a huge country with a large population. It is. 297,000sq miles of land area and 76m respectively. But Indonesia is over triple the size on both counts; 699,000sq miles and 238m. 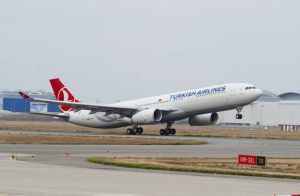 Hence it is surprising that there is only one airline with direct service between the commercial capitals of both states – Turkish Airlines. Istanbul’s Atatürk Airport is at its best late at night from a check-in perspective. No queue; check-in completed in seconds and straight through passport and security checks. After 22:30 the direct passport and security route leading into the Business Class lounge is closed but it only means a short walk inside instead. 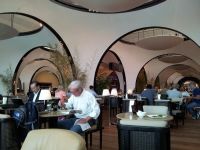 But once in the vast Business Class lounge it is chaos and congestion. It is the norm. Queues for hot food and coffees. Cold snacks limited to salads and bread-heavy rolls. A few sandwiches would be great for those not wanting a dinner. But knowing Turkish Airlines are generous with their on-board catering I saved myself for the flight. My ride both ways was an Airbus A330-300 with 28 seats in Business Class (straight forward 2+2+2) and 260 in Economy. Boarding commenced later than the time stated on my boarding pass. An announcement declared the usual priority boarding classes but in fact there was no control and everybody surged through the single door to the single boarding bridge. A tray of colourful soft drinks came around after boarding; Champagne available on request though not offered. 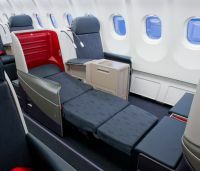 Prior to take-off the Business Class cabin was a constant bustle with crew rushing back and forth with bags of pillows; blankets; boxes and one pack of “Medical Equipment”. Not exactly a calm atmosphere. After take-off the chef introduced himself with a tray of Turkish Delight. Then menus were distributed on which names and seat numbers had been written. Mine had another passenger’s name and seat number. I pointed it out and was handed a pen and asked to change it myself. The reason name and seat number are important is that part of the menu is for breakfast and is collected before you go to sleep. Orders for drinks were taken; 41 minutes later my gin and tonic arrived along with a bowl of luxury nuts. I ordered the lamb for dinner. It was excellent though I had to ask for a glass of wine; none was offered. Dessert and cheese trolley service was a mess as they kept moving it up and down and forgetting where they had reached. Sleeping was a luxury on the totally flat bed. I was woken by a noise two hours before landing at the intermediate stop of Singapore. A flight attendant standing there with my breakfast tray although I was still nearly flat and obviously had not opened my meal tray. It was the same for the entire cabin; they were there with breakfast trays though nobody had their tables open and the dividers between seats were full of glasses and water bottles from the night as well as the hot towels and their china holders previously distributed. Breakfast was substantial but totally à la Turka; personally I don’t enjoy olives and salty cheese with my breakfast although there was plenty of choice overall. Tea was served from a large teapot but was nearly cold. Later the steward returned to ask if I would like some more. I asked if it was hot – he felt it and said it was, so I had some. But it was coffee. After clearing away breakfast trays the chef came through reaching across in front of one’s nose to pick up glasses, and a moment later returned to collect other items. I suspect because it seems some items go to the galley at the front of the cabin and some at the rear; but it was a totally inelegant process without a single “excuse me please”. Announcements throughout the flight were inaudible largely because they were spoken so quietly. At Singapore everybody has to de-plane with hand luggage and return through security. Final short sector to Jakarta was very lightly loaded and a small snack served. Returning from Jakarta I was standing in a short queue at the Business Class check-in desk when someone came and invited me to use the Business Class check-in lounge which was very efficient. Boarding very professional although easy to do as a very light load again. Before take-off the cabin crew were standing in the front of the cabin having an animated and noisy conversation between the four of them across the heads of the passengers. They moved to the galley and continued their noisy chat until take-off. Thereafter offered a drink but no menu given so I did not know what we were going to eat. In the end it was a tasty hot snack. I requested some dressing for the salad and was given a bottle of lemon/olive oil from which to help myself. The snack was cleared away 24 minutes after take-off on the 1hr 30mins flight. Same process at Singapore but well organized through two jetties. 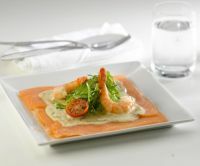 Once again there was plenty of food but as on the outward flight the cabin service very erratic and totally lacking any coordination, charm and grace. Cabin crew are much more communicative with non-Turkish passengers these days, but the whole experience is nothing like as professional as that on many other carriers. And presumably it is one of the reasons Turkish Airlines fail to achieve a 5-Star rating. The in-flight entertainment is extensive although their movie selection is somewhat eclectic. Aircraft clean and bright though rather bland. Some colouring of the lights would help. One toilet out of action and some had hot water; some not. Both flights landed early. After landing in Istanbul I went to their new arrivals lounge. Surprisingly it is not mentioned during the return flight when announcements were clearer; nor did I find mention of it in their magazine. A mini version of the departure lounge; but usefully including an ironing service as well as showers; snacks; soft chairs, etc.